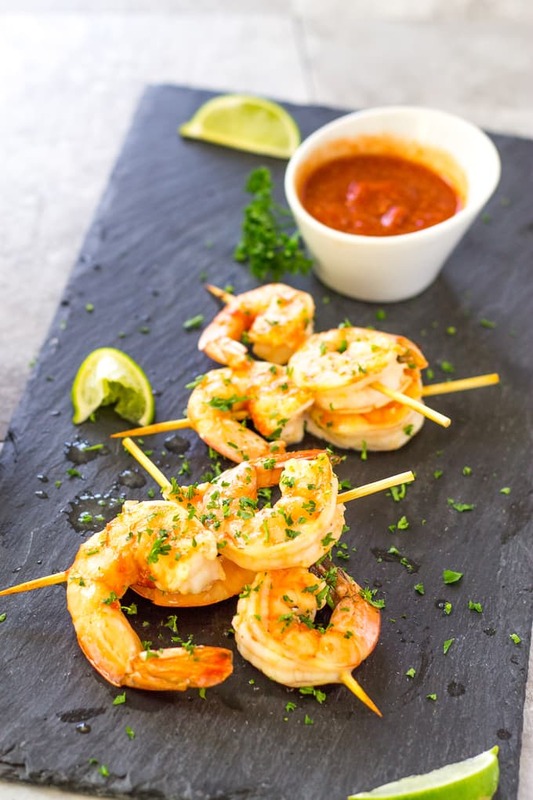 Spicy Margarita Shrimp Skewers are perfect for your next party. Tequila, lime, and a hint of Sriracha make these shrimp extra delicious! You guys know that I am in love with margaritas. Tequila and I have had a rocky relationship but we are together again and no longer on a break like Ross and Rachel. I recently made a 3-ingredient margarita for my 3-ingredient cocktail series. It was delicious and super quick to make. You know, for those cocktail emergencies. Now I am taking my tequila relationship to another level with Margarita Shrimp Skewers! These margarita shrimp are a bit on the spicy side, like a margarita with a kick to it, that pairs oh so nicely with the sweet and juicy shrimp. Think of it as the perfect marriage of shrimp cocktail and a margarita. Who doesn’t love the thought of that? Let’s get started with a spicy marinade that has all the components of a margarita. Lime, salt, tequila. And then throw in some Sriracha for spice, some garlic for flavor, some honey for a hint of sweetness to counter the heat, and some olive oil to bring it all together. 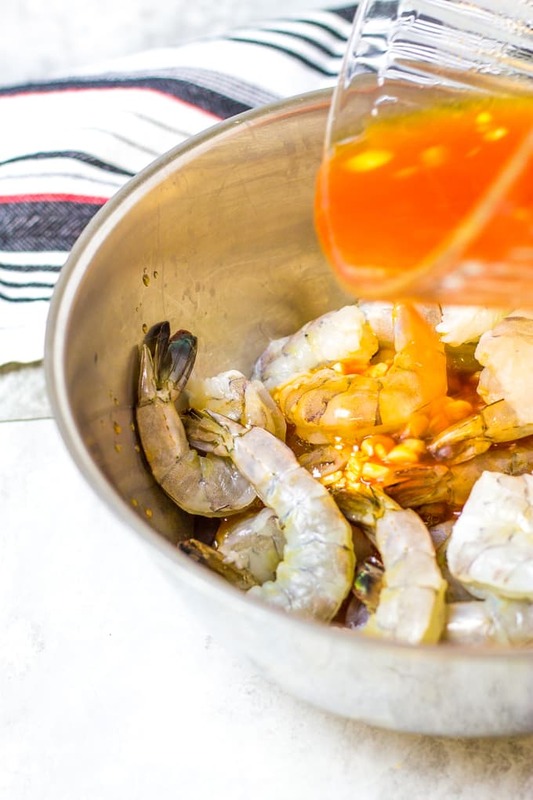 How long should you marinate shrimp? If the shell is on the shrimp still you can marinate them for up to 2 days if the marinade isn’t too acidic. 8 hours with the shell off. If you use a highly acidic marinade I would only go about 30 minutes to an hour. This margarita marinade isn’t too acidic even though it does have lime juice so I like to go about 4 hours. I’m going to grab some large shrimp that I have (I use the 16/20 count for this) and peel, devein, and butterfly them. Pour the marinade over the shrimp and cover. Store them in the fridge for 4 hours. You can go less than this but the shrimp won’t absorb as much of the margarita flavors. Can we really call them Margarita shrimp then? While the shrimp are getting all cozy in the marinade, soak your skewers if you are using wooden ones. This will keep them from burning while cooking on the grill or in the oven. 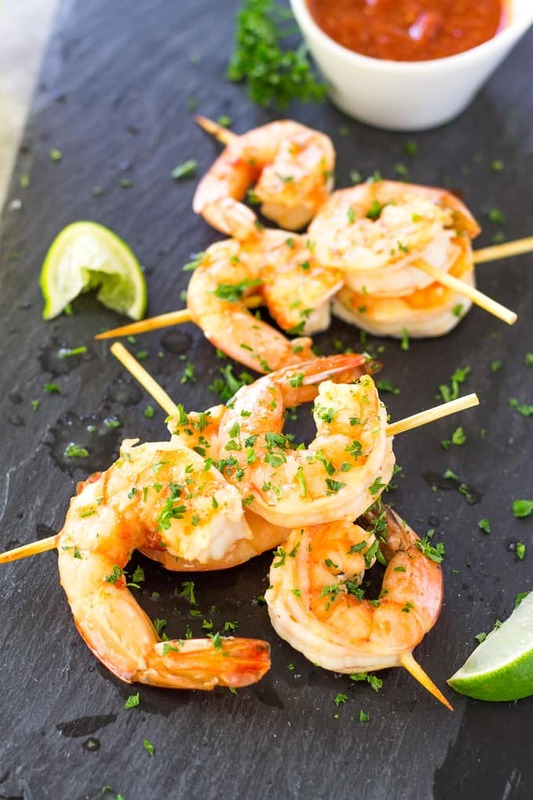 When you are ready to serve these yummy Margarita shrimp to your guests, put two or three on each skewer. I like to stick the shrimp twice to keep their shape and so the shrimp won’t flop around. You have two options at this point for cooking. 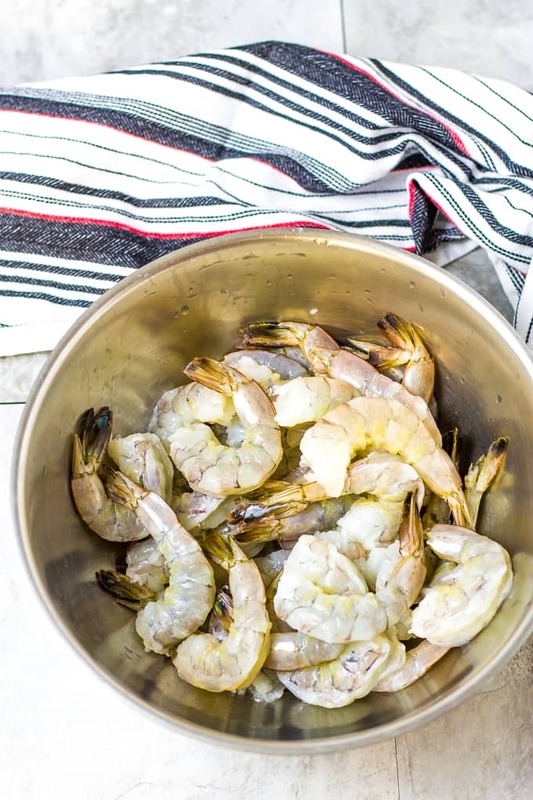 The original recipe that I use as inspiration cooks them in a skillet and uses the remaining marinade as a sauce to coat the shrimp. I baked mine in the oven but you can also throw them on the grill if you are already partying outside. Any way you do it, the shrimp will be plump and delicious! I am adapting this recipe as an appetizer so I am serving them on skewers. Too much sauce would be messy so I opted for a dipping/cocktail sauce. 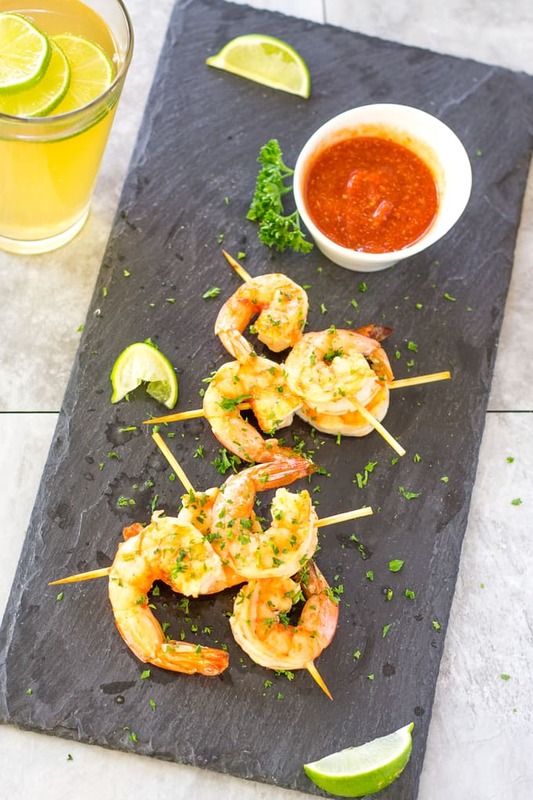 The combination of the Margarita Shrimp skewers and the spicy cocktail sauce has such a great flavor and the right amount of heat! You can’t have shrimp without a cocktail sauce. Even if they are already spicy and full of flavor. They just seem naked without a little skinny dip, or chunky dunk, in this tasty sauce! This Spicy Cocktail Sauce is so good I might use it on my crab legs too! 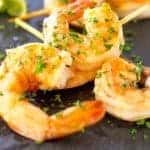 These Margarita Shrimp Skewers have all the flavors of lime, tequila, and salt with plump juicy shrimp that can serve as a full meal or appetizers for a party! Start by marinating the shrimp. Place your peeled (leave the tails on for presentation if you want to) shrimp in a large bag. 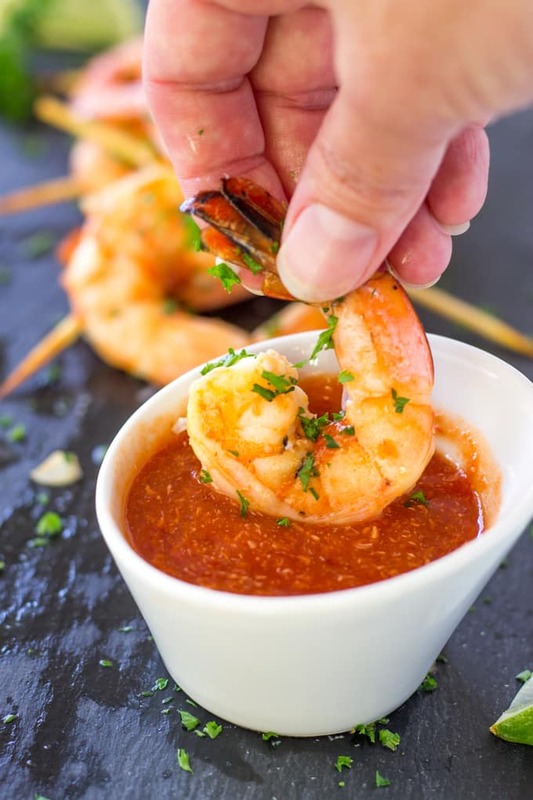 Mix your marinade by combining Sriracha, honey, tequila, lime juice, garlic, and 2 tablespoons olive oil. Pour over the shrimp and close the bag. Store in the fridge for 4 hours. When ready to serve, place 2 or 3 shrimp on each skewer. 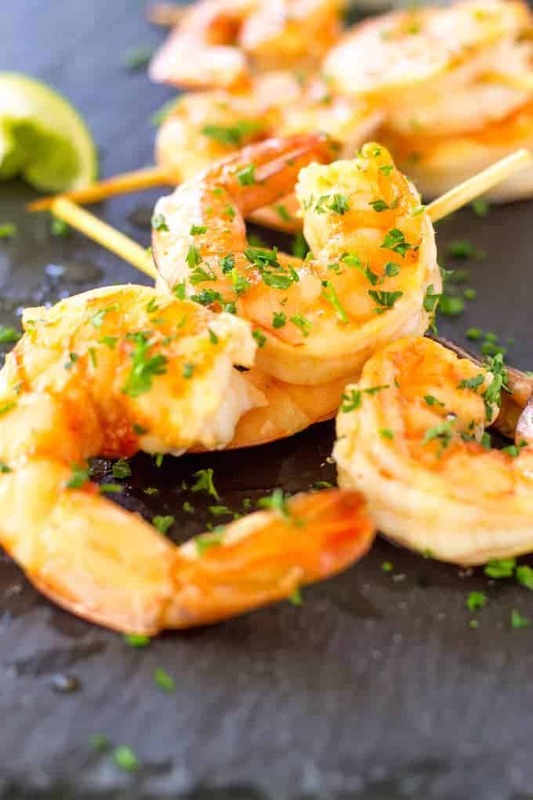 Place the shrimp skewers on a baking sheet and bake for 8-10 minutes or until shrimp are done to your liking. 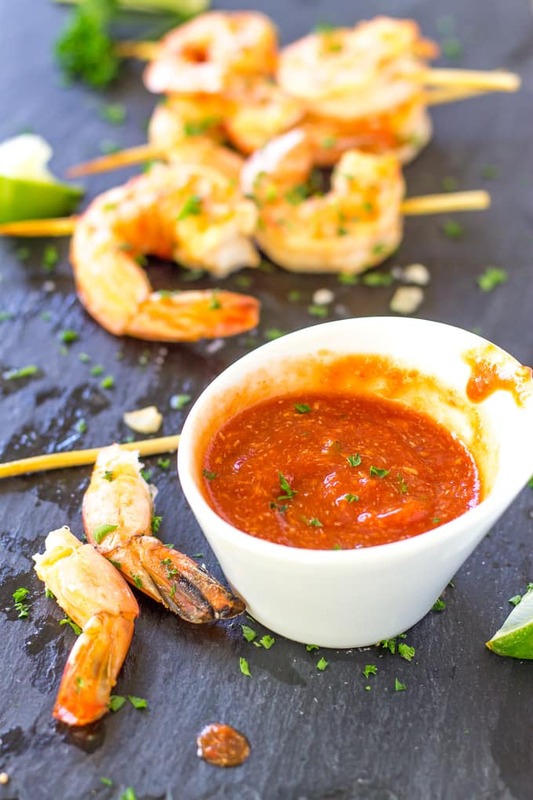 While the margarita shrimp skewers are cooking, prepare the cocktail sauce. Mix the cocktail sauce, prepared horseradish, and Sriracha and place in a serving bowl. When the shrimp are done cooking remove them from the oven. Serve them on the skewers with the cocktail sauce, lime wedges for squeezing, and a sprinkle of parsley. I am bringing you this recipe as part of our Freaky Friday Blog Hop. The original recipe is for Spicy Tequila Shrimp by Sandra at The Foodie Affair. 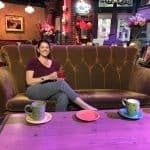 Sandra says that she is not a writer, photographer or chef, but a self-taught home cook, wife, mother, and full-time professional worker bee. I am in touch with these titles too! She enjoys fresh flowers, candles, wine, and food that looks good and tastes scrumptious all the while working out and running to keep on enjoying all the yummy treats she makes! Sandra blogs recipes that fall all over the spectrum. She has some healthy posts like her Chunky Avocado Dip and some sinful dishes like her Poutine Gravy Fries. Don’t forget about her sweet treats of which she has healthy and decadent ones. Her Chocolate Chips S’mores Cookie Skillet and her Fruit Kabobs with Chocolate Cherry Yogurt Dip. 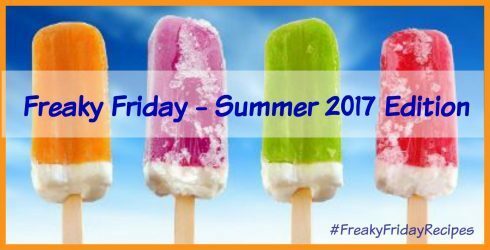 Check Sandra out as well as all the other bloggers that are participating in this summer’s Freaky Friday! Freaky Friday is a secret recipe swap between a group of bloggers where we make a recipe from another blog. But, the secret comes in to play, because you don’t know who is making something from your blog and what recipe they are recreating. Only the event organizer knows who is assigned to which blog. Then on Friday we all post and share all the recipes! Like secret Santa but way more delicious! Last Freaky Friday I made Pineapple Hummus from Lisa’s Dinnertime Dish and the one before that I made Creamy Corn Crock Pot Dip from Debi at Life Currents. Here is a list of all the other bloggers that are participating! Click on over to see the recipe they recreated and the original blog! Which one of these amazing recipes is your favorite? Tequila, Lime and Shrimp, what a wonderful combination. They also look absolutely delicious. I would have to agree that margarita + shrimps are a great combination. Thank you for sharing this easy and interesting recipe. Can’t wait to try this. These shrimp sound lovely!! That sauce must be so delicious reading those great ingredients! Thank you so much! It is very delicious and I could not stop licking my fingers while taking the photos!